The Canadian German Chamber of Industry and Commerce will hold its Renewable Energies in Buildings conference in Toronto next month. The half-day event, which takes place on May 29 at the Allstream Centre, is geared toward renewable energy and building industry professionals. 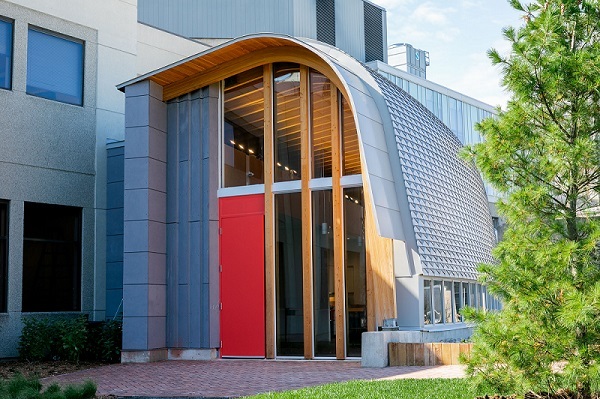 Exterior of Odeyto, Seneca College’s new Indigenous centre at its Newnham campus, Toronto. A new Indigenous centre has opened at Seneca College’s Newnham Campus in Toronto. Named after the Anishnaabe word “Odeyto,” which translates to “the good journey,” the multipurpose facility is the new home of FirstPeoples@Seneca. It is also accessible to members within the broader Indigenous community. Indigenous culture influenced various aspects of the facility, from its general exterior shape to the details of its interior décor. The space was designed by Gow Hastings and Two Row Architect, a 100 per cent native-owned and operated firm on the Six Nations reserve in southern Ontario. 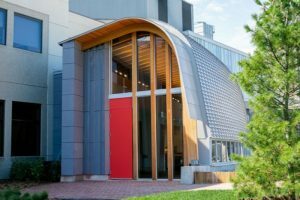 “The structure looks like a canoe resting on its side and the curvature of the roof mimics the position of the sun on June 21, the annual National Indigenous Peoples Day in Canada,” explains Mark Solomon, associate dean student services and Indigenous education. A neon sign created by the Cree visual artist Joi Arcand is among the features inside Odeyto. Equipped with an office space, a computer lab, and a kitchen, Odeyto is a dedicated space for Indigenous elders.